Just 24 hours after he began his 2020 bid with a low-key, early-morning announcement on a Vermont public radio station, Sen. Bernie Sanders's new campaign was rolling in $6 million in cash -- more than triple what his closest Democratic opponent, Sen. Kamala Harris, raised after her much-splashier campaign kickoff. 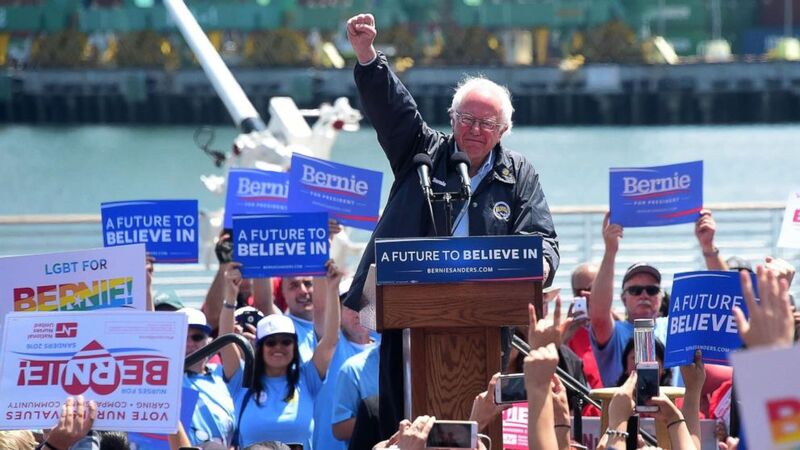 And despite the past year's hunger for fresh faces to represent the Democratic Party, political observers say it's no surprise that Sanders -- a 77-year-old white man who's held office for decades -- entered the fray with a groundbreaking financial advantage. Why? Because, they say, his biggest plus is that he isn't new at all. "His team is able to push a button and get $6 million immediately. That's something other campaigns are going to be building from scratch," said Zac Petkanas, a director on Hillary Clinton's 2016 presidential campaign and current Democratic strategist. Sanders has worked hard to stay in the public eye -- and at the top of voters' minds. He was a constant presence on the trail in 2018, campaigning for nearly 10 candidates in the last week of the midterms, not risking losing visibility in the lead-up to 2020. He is the Hillary Clinton of 2020. And since running as the underdog in the 2016 presidential cycle, Sanders has continued to call for economic justice in the halls of Congress, while his organization, Our Revolution, has for three years been laying the groundwork to be the "next stop in the Bernie Sanders movement." Then, on Tuesday, Sanders showed the results of that groundwork: He typed an email and raised millions of dollars. "It was foolish for anyone in the Democratic establishment not to take Bernie seriously before [Tuesday]," said Neil Sroka, communications director for the progressive PAC Democracy for America. "But it's absolutely laughable to not take him seriously after the fundraising haul he was able to bring in, in a certain day." Sroka, like Petkanas, emphasized the power of in having more than 225,000 donors on Day One, especially when those supporters can turn into volunteers who can knock on doors, man phone banks or sign on for recurring donations. He also warned the Democratic Party, which largely underestimated Sanders's appeal to progressives in 2016, against making the same mistake. "More than anything, the surprise that might exist about the numbers Bernie was able to post [Tuesday] is indicative of a chattering class in Washington that doesn't understand the Democratic base and hasn't understood it in years," said Sroka, who was part of a group that urged Sen. Elizabeth Warren to run in 2016. That loyal base outside of Washington -- the quarter of a million people who donated to Sanders right out of the gate -- proved Tuesday that they're still hanging on. The question that remains is if they'll stick around now that they have a dozen other options, Sroka added. "It's important to keep in mind how early we are in this process," Sroka said. Yes, Sanders raised a staggering amount, but the range of support for all of the candidates is expected to "ebb and flow and change dramatically." "Bernie Sanders is the front-runner in this race, there can be no doubt about that," Petkanas, who knows a thing or two about running a campaign against him, said in a phone interview after Sanders' fundraising hit the $6 million mark. "He's clearly the candidate to beat right now." But with that attention will come new scrutiny, Petkanas said, similar to that experienced by his candidate, Hillary Clinton, long deemed the front-runner in 2016. (Justin Sullivan/Getty Images, FILE) Democratic presidential nominee Hillary Clinton and Sen Bernie Sanders greet supporters during a campaign rally at Coastal Credit Union Music Park at Walnut Creek, Nov. 3, 2016, in Raleigh, North Carolina. 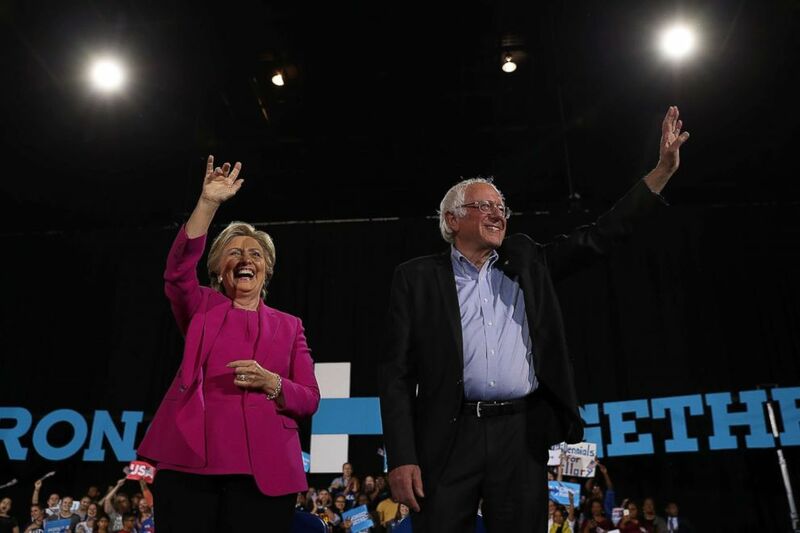 "In 2016, Bernie Sanders was never covered as a viable candidate -- he was covered as a thorn in Hillary Clinton's side," Petkanas said. "So, his policy proposals were rarely measured on the basis of how they would work, but how they made Hillary Clinton's proposals seem conservative or weak by comparison." Petkanas predicted this cycle, and Sanders' front-runner status, will make for a different set of challenges. "He's going to get treated as a viable candidate, and viable candidates get vetted," Petkanas said. "He is the Hillary Clinton of 2020." In a recent opinion piece, Petkanas wrote about what he predicts will haunt the candidate, including a soft record on gun-control legislation. Petkanas, who runs the Democratic communications firm Petkanas Strategies, said he isn't currently working with any 2020 candidates, or on gun issues. Sanders also is up against at least five times as many candidates this time around, at a time when the Party's emphasis is on opening up to more racial and gender diversity. "I think it is certainly not to Senator Sanders' advantage that he's an older white guy," Sroka said. "That is not helpful to him in the 2020 Democratic primary because I think there is some genuine hunger to see the next generation of candidates." But, Sroka said, no candidate in any election is perfect. "Every candidate is going to have their weaknesses and flaws and mistakes they make, and demographic boxes they just will not be able to pick," Sroka said. How might Sanders alter the race? It's early. Very, very early. And every strategist and polling team will say as much. 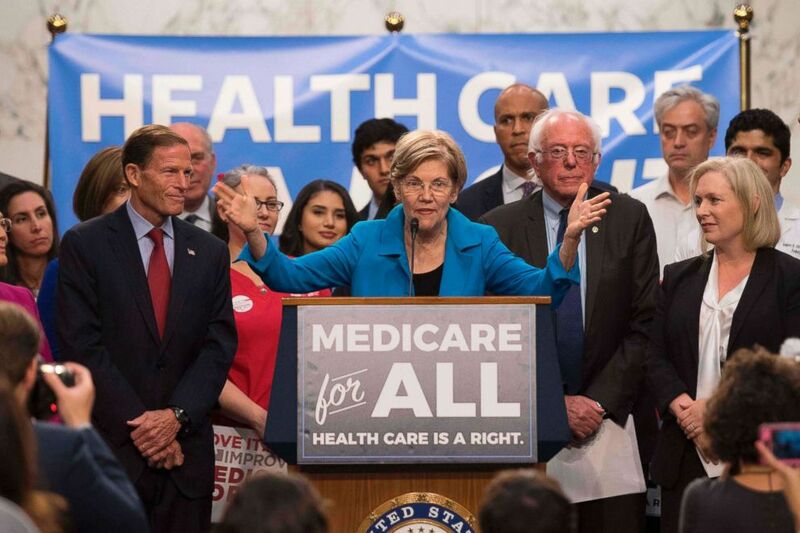 Adam Green, the co-founder of the Progressive Change Campaign Committee, which supports Sen. Elizabeth Warren, D-Mass., and former Rep. Beto O'Rourke of Texas, said Sanders' success certainly means he's a front-runner -- for now. "We've done polling of New Hampshire and Iowa, and a couple things are true from our vantage point," Green said. "One is, clearly he will be a top of the pack at the beginning." But the vast field of candidates means they'll jostle each other around, issuing policies on issues like health care and immigration that push more progressive or more moderate while they vie for votes. "The notion of a zero-sum progressive lane is completely wrong," Green said. "Many candidates draw from each other and many candidates have vast room to grow based on the cases they make to voters." What Sanders' launch does show, Green said, is that the excitement from Democrats, which made a strong showing in the 2018 midterms, is still humming along. "Bernie's launch was huge and it was an important assertion of power for progressives, as well as high energy for Democrats," Green said. "I think everybody on the progressive side should take it as good news and see it as an example of more is more. "It would have been bad news if someone like Bernie Sanders launched to a whimper."